Minimum wages in the San Francisco Bay area city of Emeryville are set to incrementally rise over the next five years, reaching $16 an hour by 2019. City authorities say the recently adopted decision serves the common good, brushing off business concerns. Situated between Berkeley and Oakland, across the bay from San Francisco, Emeryville has a population of just over 10,000 in about two square miles of territory. “We’re in the middle of a very large, high cost-of-living metropolitan area,” Mayor Ruth Atkin told RT. Atkin explained that Emeryville adopted a minimum wage – indexed for the cost of living in 2006 – for city employees and businesses that contract with the city. Currently, that wage is $14.44 per hour. That is expected to rise to $16 by 2019, indexed for inflation. The initiative adopted last week would gradually extend that minimum wage to all businesses in the city, making it the highest minimum wage in the US. Under the proposal, businesses with more than 55 employees would have more time to implement the wage hike. Seattle adopted a similar two-tier system in 2014, making 500 employees the dividing mark between “small” and “large” enterprises. The International Franchise Association has objected, suing Seattle under the 14th Amendment’s “equal protection under the law” provision. Emeryville authorities admitted they sought to harmonize the wages of local businesses with those in the neighboring jurisdictions. “To be able to pay workers depending on which location they work at was kind of ridiculous,” mayor Atkin said, citing the example of a restaurant with locations in San Francisco, Oakland and Emeryville. Restaurants and similar businesses, she acknowledged, were “already wondering how they will maintain their small margins and still be able to exist,” and will most likely add service charges and other ways of passing the cost to the consumer. “Time will tell,” said Atkin. Raising the federal minimum wage to $9 per hour would result in the loss of up to 200,000 jobs, while pushing it to $10.10 might eliminate half a million jobs, the CBO said. Most of the April 2015 growth in employment – 223,000 jobs – according to the Department of Labor – was in part-time jobs, construction and low-wage service industries, while manufacturing and mining sectors have seen a contraction. Established by President Franklin Delano Roosevelt in 1938, the original minimum wage was 25 cents per hour. The current federal minimum wage stands at $7.25 and has been unchanged since July 2009. Many states and localities around the US share Emeryville’s concern that the wage floor has not kept pace with inflation and have passed minimum wage increases. Labor protests under the banner of “Fight for 15” – meaning, a $15 minimum wage – have been sweeping the country for months. 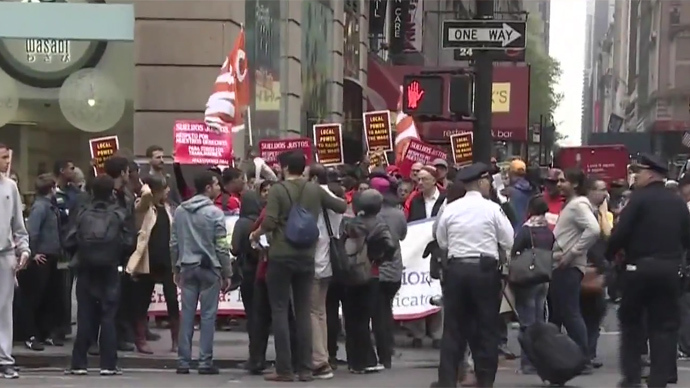 At the forefront of the protest are the low-wage workers in the food and hospitality industry.